It is an amazing experience to watch the sun in the middle of the night, but this is possible in the northern part of Sweden. The earth is rotating at a tilted axis relative to the sun. During the summer months the North Pole is angled towards our star, and for several weeks the sun never sets above the Arctic Circle. Therefore it is possible to watch the Sun middle of the night in the north of Sweden. Swedish Lapland and the further you go, the longer it last. 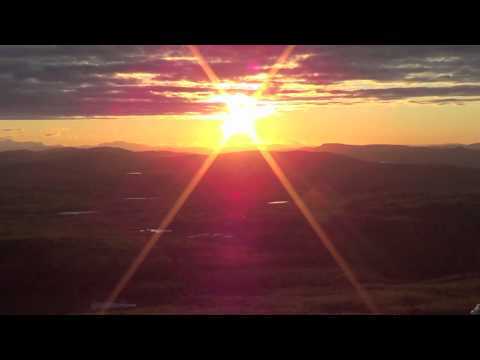 In Abisko, one of the most northern towns in Sweden, it is possible to see the Midnight Sun from May 27-July 18. In Kiruna, 1000 km north of the Arctic Circle i is possible to see it in the same period. The Midnight Sun shines in Swedish Lapland for a hundred days and a hundred nights every summer. If you are a bit on the adventurous side, you could wander off in one of the magical forests, find your own crystal-clear secluded lake, and treat yourself to a liberating Midnight Sun swim tours. Get in touch with nature, and with yourself. The river valley of Råneå River, Sweden's longest woodland river, is ideal for all types of outdoor adventures and activities. From its source to the coast, you would find both calm water, gentle currents and thundering water streams. All of which makes it ideal for both fishing, meditative kayaking and adrenaline boosted rafting. You can explore and enjoy beautiful hikes along fascinating nature trails. Through deep forests, along with the untamed wild rivers, there's a good chance of catching a glimpse of wildlife, including moose, reindeer and even bear. It is the perfect combination of Midnight Sun experiences, relaxation and adventure, quite simply.